A 1984 graduate of Bristol Eastern High School, Chryss Watts was an All State selection in three separate sports – volleyball, basketball and track & field. She was Class L long jump champion and a member of Bristol Eastern’s 1983 state championship basketball team. She earned a full scholarship to attend the University of North Carolina – Chapel Hill where she participated in track for three years and lettered in basketball all four years. She played women’s team handball following college and was a member of the U.S. team 1989 through 1997. She was a member of the 1992 and captain of the 1996 U.S. Olympic women’s team handball team and was selected “Female Athlete of the Year” in team handball in both 1995 and 1996. She served as a member of the board of directors for U.S. team handball for a number of years. In 2014 she was inducted into the CT Women’s Basketball Hall of Fame. In 2018, the Bristol Tramps honored Chryss with the Lydia Jabs Bailey award. “Basketball was the springboard for my success in life,” says Chryssandra Watts. 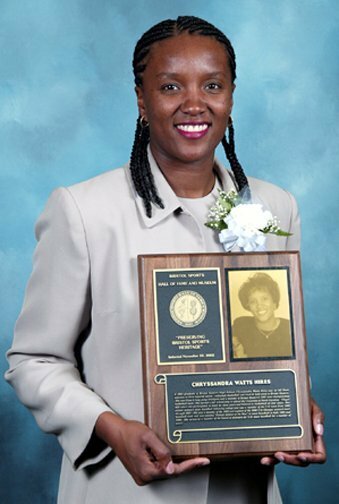 A forward/center at Bristol Eastern High School from 1980 through 1984, Chryssandra Watts averaged 15 points and 16 rebounds per game during her high school basketball career. In 1983, Bristol Eastern High School won the CIAC Class L State Championship. In 1983 and ’84, Chryss played forward on the New England AAU Girls’ Basketball Team, captured the CIAC Class L Long-Jump Championship in Track and Field, and was named All-State in basketball, volleyball, and track in 1984. She was inducted into the Bristol Sports Hall of Fame in 2002. At the University of North Carolina in Chapel Hill, Chryss played guard/forward for Coach Jennifer Alley and Sylvia Hatchell. In Track and Field, Chryssandra’s specialties were the long-jump, triple jump and heptathlon. Her efforts helped UNC win the 1988 ACC Championship. Chryssandra Watts is a two-time Olympian in Team Handball (1992 and 1996). In 1995 and ’96, Chryss was named Female Team Handball Athlete of the Year. In 1994-96, Chryssandra was team captain for the National and Olympic team. For three years, Chryssandra served on the Board of Directors for Team Handball and for two years, on the United States Olympic High Performance Planning Committee.